I had seen this place virtually so many times before. Travel blogs, sites, magazines, everywhere I looked, I'd end up reading about this place. Usually on some high ranked position in the list of "the most unique lodging" or "the best glamping place" sort of articles. Garden Village Bled, that's the name of the place. 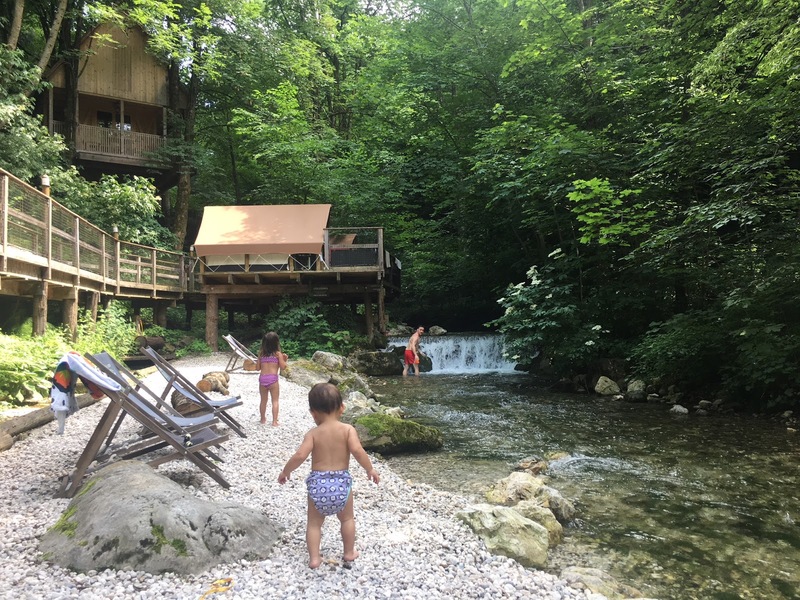 It's a small resort near Bled lake in Slovenia that offers unique lodging experience in pier tents on the river, tree-houses and glamping tents with personal Jacuzzi. I told my husband about it and he was down immediately with a weekend getaway. I booked a pier tent for a weekend in June (it's €120 a night during high season including great breakfast, although the price is lower during low season). 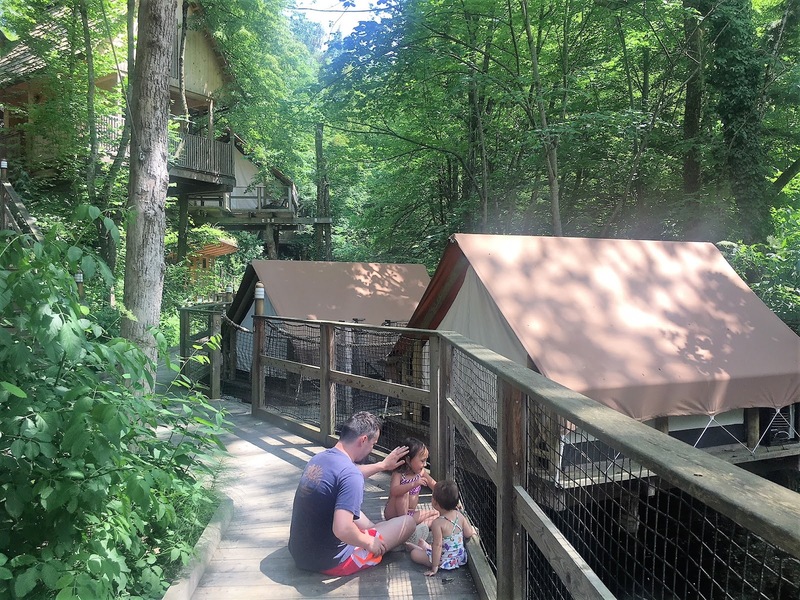 Tree-houses and glamping tents were too big and too expensive for us, so I checked with them on the phone and they say it's okay with them that we take pier-tent (normally for two persons) for us with two small kids. That Saturday we had slow breakfast at home, the headed to Bled. A little earlier than noon, we're already at the resort. The loveliest staff let us know that our tent wasn't ready, but we're most welcomed to be at the resort and enjoy the pool. Once we saw the pool area, the kids freaked out. The view was just breathtaking. It's an Eco-friendly and non-chemically treated infinity pool with natural ecosystem in it, with a beach-like entrance. The water was a little chilly for June, but nothing stopped the kids to jump right into it. There is a kids' park across the pool as well with swings, slide, sandbox and kiddie picnic table with large wooden building blocks. The pool was full of tadpoles and froglets, which was an absolute hit for the kids. My kids and other kids hop around looking for tadpoles and froglets, learning about different stages of frog lives. The kids also realized how amazing it was to dive into the fresh water, which didnt't burn their eyes like the salt in the sea water and the chlorine in the public pools. The kitchen of the restaurant opens by 1pm so we ordered lunch on site. Not only the make good meals, most of the ingredients they use are fresh from their own garden and green house. If you happen to be in Bled but staying somewhere else, do know that their restaurant is open for public, so you can grab delicious lunch or dinner and enjoy the place. You'd have access to the pools, terrace and the bonfire area, but you won't be able to go to the tents and tree-houses area. By 2pm our pier tent was ready and we're settled in our tent. Here is a hint: the pier tents and the tree-houses are located in the part of the resort where the creek is. Basically, you'd sleep on the creek full of fish with private beaches equipped with lazy deck chairs. This also means you'd hear the creek the whole day and night, which could be annoying for some people. We, however, loved the sound. The glamping tents are located on the other side of the resort, on the dry area with no creek, but with individual jacuzzi for each tent. There's basically just a double bed in the pier tent, with night stands on each sides and table lamps on each stands. On the deck of the tent though, there's a lockable chest where you can put your stuff, a pair of comfy chairs, coat hangers and a fridge. There's a padlock for each tent so you can leave your tent locked. LED lights are built in along the deck to lit the way at night, and there are two sets of bathrooms, toilets and sinks shared by nine tents. On each set, 2 toilets and 2 showers are available, so it's basically never crowded even when all nine tents are occupied. 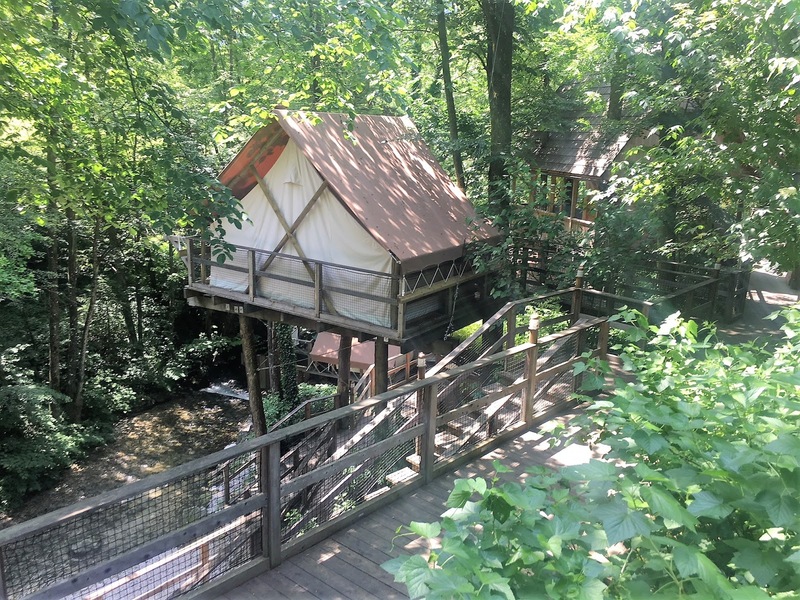 Some of the tents have a private access to the creek with ladders coming down from their personal decks toward the creek. Not all tents have it, so if you'd like a private access, notify them at reservation to give you the specific pier tents with the ladders. Otherwise, everyone can go to the common beach which we enjoyed a lot. After spending the whole day swimming, we decided to actually go to Lake Bled in the evening for a walk and for dinner. Although basically there's no need to get out of the resort because you absolutely have everything here. Honestly, I just really wanted to get my favorite Bledska kremna rezina, or cream slice of Bled, which is absolutely delicious. The only way to have it is at the Hotel Park on the hill foot of Bled Castle, so we ate the cake there. You can rent bikes from the resort to cycle around the lake, or if you prefer boat ride, one of two docks of the Bled traditional boats is located near the resort. Since the capacity of Garden Village is not too big (which absolutely is a strength of the place), it might be hard to book a tent or a tree-house for your preferred dates, but it's worth a try. A tree-house is definitely a better option if you have bigger kids or larger family. We aim to come back and try the tree-house sometime next summer since the kids enjoy the place so much. The toddler got stung by nettle leaves when trying to pick up a snail on it, but hey, that's part of the learning isn't it? If you're not afraid of cool water and chilly air, in October they have special offer where you pay for one night and get a two-night stay.